Most chart setups take one of three major forms: breakout, consolidation, or divergence. In this webinar, Michael and Julia will walk you step-by-step through the easiest ways of scanning for each of these major formations. You'll see scanning techniques that are easy to learn, adjustable for your own applications and re-usable. Momentum indicators characterize price direction and acceleration. Many of them behave similarly and have shared best practices in interpretation. Join Julia and Michael for a discussion of momentum indicators. You may find a new indicator to add to your favorites or a new use for an indicator you've used all along. Pivot Points are used by many professional traders to identify likely key price levels. If you're new to Pivot Points or want to learn more, join Michael and Julia for a discussion of what Pivot Points are and how they work. You'll learn textbook interpretation and will gain a better understanding of real-world application through current chart examples. Julia and Michael will share specific applications for custom formulas that they have found to be invaluable. You'll be able to identify stocks with bullish closes, consolidation patterns and even how to create a trailing Average True Range Stop indicator. Take what you learn and apply these easy-to-learn concepts to write formulas that meet your own needs. What should you do when you want to scan for stocks with very specific characteristics? You write a custom condition formula, of course! Not sure how to do that, you say? Join Julia for an introduction to writing custom condition formulas. They'll provide you with all the information you'll need to get started right away. The more organized and methodical your chart research, the more effective you'll be as a trader. Join Julia and Michael to learn the most useful tips and tricks for adding efficiency to your research routine. They'll highlight best practices in scanning, charting, and watchlist management. This approach is so simple and thorough, you can easily use it every day. TC2000 will monitor any condition, price point or trendline for any symbol and let you know immediately when that stock hits your desired target. When you find an interesting chart, set an alert to monitor breakouts, trend changes or technical behavior and get an email or text message immediately. Join Julia and Michael as they show you how you can let Worden servers watch you stocks for you! Becoming a better trader requires becoming a better record keeper. Using TC2000's personal note feature, you can fully integrate your trading journal to record your thoughts, analysis and trade details. Notes will help you remember how you found and stock, what you liked about it and why you did or didn’t trade it. Layouts in TC2000 allow you to create custom trading environments with the tools you want at your fingertips. To spark ideas on how best to utilize layouts, Julia & Michael will each share a few real-world examples of their favorite personal layouts. They'll show you why they like them and how they use them. TC2000 offers multiple information feeds that gather the best of stock market research and connect it directly to your charts. It is essential to learn to filter that data to what is most important for your trading style. Join Julia and Michael as they show you easy ways to build a relevant list of Twitter, News, TC2000 User and Corporate Calendar posts to aid with your stock decisions. Many of the most effective price patterns on stock charts occur in some form of consolidation. Finding stocks in consolidation is an easy way to build a WatchList of candidates poised to make their next move. Julia Ormond and Michael Thompson will each share the criteria, creation, use and results of one of their own unique EasyScans for finding consolidation. WatchList columns in TC2000 allow you to rank any WatchList by any condition or value. Join Julia and Michael as they demonstrate a number of unique ways to combine and save WatchList columns so you can apply them to any WatchList you choose. Whether using technical indicator values, fundamentals, price performance criteria or even your own custom formulas, these column sets are invaluable for sorting WatchLists on the fly. It is easy to compare multiple price plots on one chart in TC2000. This technique creates easy-to-understand relative strength relationships between symbols. Easily make apples-to-apples comparisons between stocks, ETFs, Indexes or any related symbols you want. You'll instantly see stocks moving together or diverging and how they are performing against each other. It is important to have the analysis tools you need at your fingertips. Learn to create layouts in TC2000 from scratch and customize your trading environment. Combine tool windows like WatchLists, charts, news, EasyScans and more to create layouts that streamline your research. Drawing notations on charts can be an essential part of the research process. Learn to use TC2000 drawing tools to draw trendlines, Fibonacci retracements, text, linear regressions, etc. on your charts. You'll find you see patterns, trends and changes much easier as support and resistance levels pop with the drawings. Plus, set alerts for trendlines and price with these drawing tools. An organized trader is an effective trader. How often do you miss trades because your mental notes fall through the cracks? Are there certain charts you know you should be reviewing every day but don’t because they’re not conveniently organized? Learn how to avoid these common pitfalls and turn yourself into a more organized, efficient and effective trader. Identifying the most relevant stocks to a market move is a breeze with the Custom Date Sort feature of TC2000. Join Julia Ormond and Michael Thompson to learn everything you need to know about Custom Date Sort and finding the strongest performers. Alerts make it possible to monitor chart activity - even when you have to be away from your computer. Learn to set and monitor Price, Trendline, and Condition Alerts using TC2000. Being a good chart reader doesn't mean you have to ignore the quality of the companies you trade. Join Julia Ormond and Michael Thompson as they explore seamless ways to blend fundamentals into your chart reading. Whether it's earnings, revenue, institutional ownership or return on equity, you can quickly access and analyze this information without ever leaving your charts. 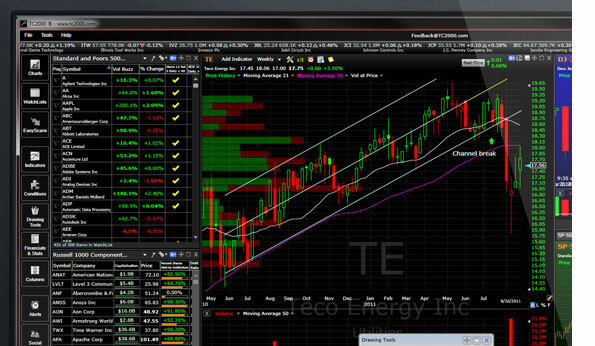 TC2000 gives you the ability to view and analyze as many charts at one time as you like. Julia & Michael will show you how to set up, organize and utilize multiple charts in any layout. You'll see how simple it is to view several charts with different time frames, indicator sets or even various symbols at once. You spend valuable time looking for charts with interesting price and indicator behavior. Join Michael Thompson and Julia Ormond as they explain how to create conditions that can be used to quickly find charts with similar characteristics. You'll increase efficiency as you stop wasting time looking at charts that aren't telling you anything. One of the most useful workflow features of TC2000 is the ability to flag stocks. Join Michael Thompson and Julia Ormond as they show you how to use flagging to mark charts for later review. You'll learn basic and more advanced flagging techniques. 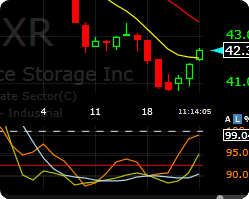 Finding relevant and tradable charts can be a challenge; you need tools that make it easier. TC2000's WatchList sorting capabilities are straightforward and powerful. They provide an easy way to find the best performing stocks and take some of the legwork out of finding great charts.